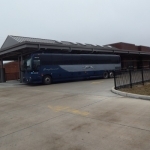 The Greyhound Connect bus service which now comes to the Richard Brazda Bus Terminal in downtown Danville is off to a good start according to Danville Mass Transit Director Lisa Beith. The buses make a loop through central and north central Illinois en route to Chicago…. Beith says instead of taking that looped route, though, you can transfer to a bus in Champaign that takes you directly to Chicago. The Greyhound Connect also provides return service to Danville. Beith says the new service is also a good way to send packages…. Beith told members of a Danville Area Transportation Study committee Thursday that she would like to be able to park more DMT buses inside. The committee agreed to let the City of Danville decide whether $50,000 in planning funds will go toward studying the feasibility of getting more inside space for buses, or else spending the funds on a program to televise city sewers. Danville Mass Transit Director Lisa Beith. She says the outbound Greyhound Connect buses leave Danville each morning at 11:00 a.m.
A south-bound bus from Chicago is scheduled to arrive in Danville around 1:30 p.m. daily – seven days a week.